A double from Johan Doiwale and Nicholas Muri’s long ranger helped Real Kakamora, the club who did not win a single match in the last season, to their third 3-pointer this season. They displayed more hunger compared to their opponents who realised the stakes a little too late and saw their efforts in the dying minutes fall short of salvaging the game for them. Barnabas Loloito who helped made history for Real Kakamora from the sidelines said that it was a matter of upping your strength and playing the weaknesses of your opponent. “We channelled our attack through weak points in Koloale’s defence while at the same time we tried to maximise our own strength. By focusing our strength on areas which we could control we were able to get the most out of our game and get this important result,” Loloito said. The Real Kakamora coach held little back when he described the importance of their win saying that finally his team can see its potential. “This is a huge win for the team, for the coaches and players and our supporters. Most importantly I think the win has made the players realise their potential and this has set a new benchmark for us in performance for this season. If we can play like this in all of our matches we will move closer towards our goals,” Loloito said. By halftime the minnows were already 2-nil in front courtesy of contributions from Doiwale and Muri. Doiwale’s effort failed to stimulate any interest from the spectators but Muri’s was a crowd-pleaser taken from 30-yards out. After receiving the pass Muri feigned a move to the right then tapped the ball back to his left football before letting loose a scorcher that beat Shadrack Ramoni easily. The second half saw Koloale continue with an easy attitude and it took the substitution in of former Solomon Warriors midfielder, Molis Gagame Jnr., to put some life into their game. Unfortunately, by then Real Kakamora were already 3-nil in front with Doiwale’s second of the game taken just a minute after the restart. The goal came from a poor pass by Francis Lafai across the face of goal which Doiwale picked up and slotted home to the right of Ramoni. Despite being 3-0 in front the match was far from over for Real Kakamora and they reminded of that when a foul by Davidson Tome on Benjamin Totori saw match referee Nelson Sogo point to the penalty spot. Totori picked himself up and hammered the ball into the back of the net to give Koloale a rung to climb back into the game with. With 15 minutes left on the clock Koloale’s bid to overturn their deficit was boosted when Lafai made amends for his earlier blunder to take the scores to 3-2. However, that was all that Koloale could manage and the extra minute added to the game did little to help their case. The crowd was also out for a Real Kakamora win and some were shouting for the referee to blow the final whistle and he when he finally did both sides of the pitch cheered the winner for a remarkable win. 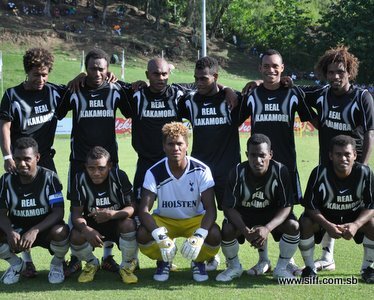 This win puts Real Kakamora in fifth place with their tally of 9 points. Their opponents, Koloale, also have 9 points but are slightly higher up in the league ladder with a better goal difference.